Void Capital presents a template, an open-source architectural blueprint for urban densification. 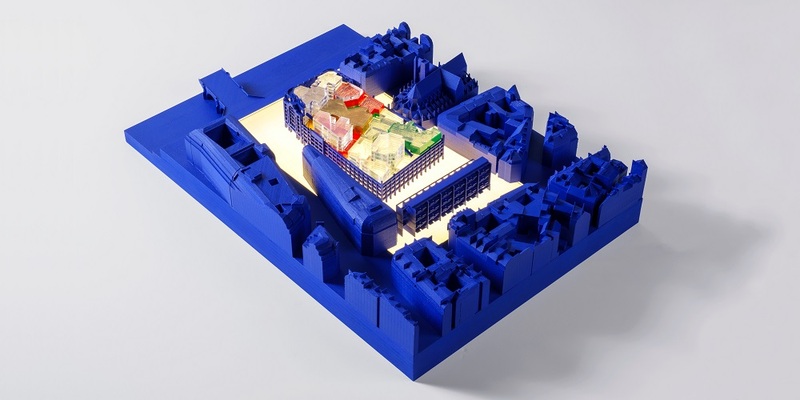 The model is implemented in La Samaritaine, a former department store in Paris. Fundamental typologies from the city’s periphery are deployed in the city centre where they create ever new architectural constellations. The housing district, Parisian rituals as a collective space. Can you briefly explain your choice of subject? Void Capital proposes a template, an open source architectural blueprint for urban densification. Its tools are fundamental typologies of the city’s periphery. They are assembled on the same site, creating ever-new architectural arrangements. Implemented in Paris, the project renegotiates the modernist typologies of: the Grand Ensemble (the Housing District) and the Quartier d’Affaires (the Business District), both once positive icons, now fallen into despair. La Samaritaine, a closed Parisian department store accommodates the two halves. Together, they form the Department City, an ephemeral scenario, rather than a finite project. What or who are your sources of inspiration and can you explain this briefly? Since the 1900s the architects interest has focussed on the Western European city center. At the end of the century, the architectural discourse about cities has undoubtedly expanded, covering new territories, like the Global South or the European periphery. At the same time however, the issue of the form of the historical city center in Europe seemed to become a matter of “commonly accepted” terms, like history or beauty, rather than a matter of discussion within the discipline. But now we are aware that when a city center is desirable, it becomes itself less and less, city-like. Here, every change is strictly prohibited. In reality, it is a hollow kind of history that is preserved. Most of the buildings have been entirely made over, their façades kept intact. The city seems to be another version of a museum, where all unpredicted social practices are expulsed. Gentrification and museification come to the fore. In that sense, La Samaritaine appeared to me as an ideal departure point: It is built at the heart of Paris’ historical centre, an Unesco protected site and it is also situated on the threshold between the old bourgeois and the working-class parts of Paris, a rapidly changing neighbourhood. SANAA’s controversial project for La Samaritaine is the landmark of this process. Furthermore, Paris offers another chance: to renegotiate -by architectural means- the unique dichotomy of the urban fabric between the city’s periphery and its centre, itself always in need of further densification. The project attempts to take a position vis-à-vis those issues by proposing an evolving, dense and inclusive, perpetually modern urban centrality. Can you briefly point out the key moment in your graduation project? The first visit to the Parisian archives: It was this moment when the project really came into being as a two-dimensional exercise.The reconstructed plans of La Samaritaine were revealed as transcriptions of a sort of a language; its most basic vocabulary were some basic, recurrent typologies (e.g. the Free Plan). This was a language which was spoken out of the building itself, not externally imposed by any architect, but developed in an almost organic way out of constraints, needs, fashions, outrageous ambitions and various phantasmagorias. Then, a three-dimensional work with digital and physical test models allowed an understanding of the syntax of this language. Simple parts of the building could be composed together into more complex but autonomous entities, the departments. 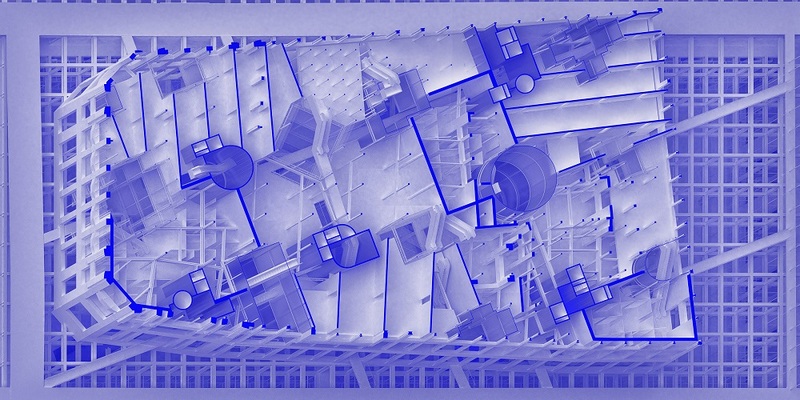 Roof plan Void Capital, implementation in La Samaritaine Paris. Void Capital explores ways of applying the typologies of the Grand Ensemble (the housing district) and the Quartier d’Affaires (the business district). Both were once positive icons of modernism but have since fallen into disrepute. Together they constitute the Department City. A perennial requirement of the European metropolis is that its density is kept up to date. This means that inner city areas constantly need reorganizing and modernizing. Demolition and conservation are both part of this Sisyphean task. Yet this natural process of actualization has been halted in the name of ‘history’ and ‘quality’. Void Capital is a way of getting the process under way again. Typical Plan, the business district. The housing district, view towards the sky. In the housing district the void is seen as a place where people can meet. For city-dwellers, day-to-day life takes place at two locations: the individual cell with the necessary basic facilities and beyond it, but still indoors, a collective hedonist retreat where certain urban rituals are enacted. A changing repertoire of urban events that were once hidden or unperceived can now be openly and infinitely repeated. The architecture of the housing district changes substantially just once every century. The department store as a city. 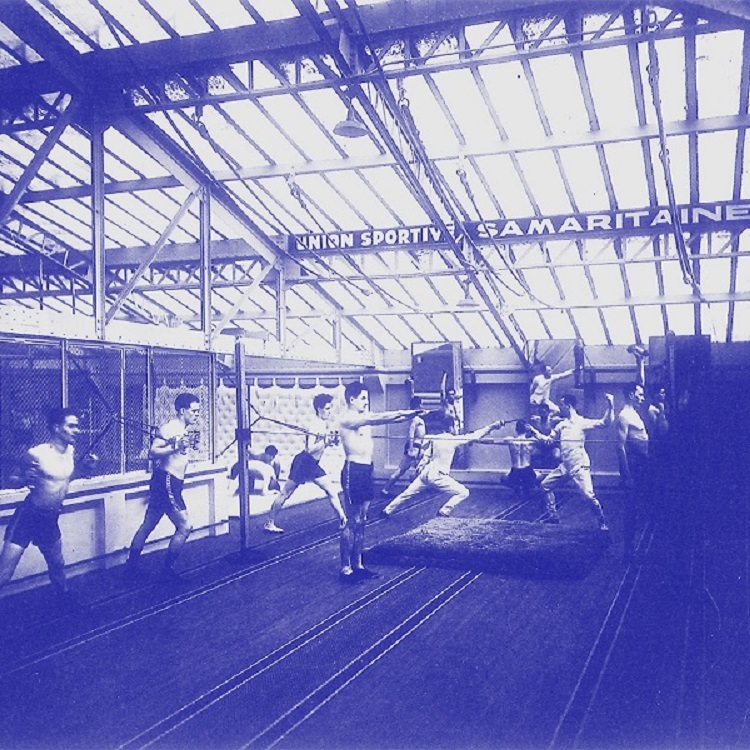 Samaritaine’s sports association, Samaritaine archives. In the business district the void acts as a tool for generating infrastructure. The district’s underlying structure reflects an adaptable architectural design evolving with time and economic context. Future scenarios are based on the heterogeneous transformation cycles set in perspective by individual site-specific analyses. Here the architect operates normatively, simply by accelerating or decelerating ongoing urban phenomena. The result being that the district is organized as distinct architectural and operational entities: the departments. Far removed from a past rooted in raw materials, the departments are programmatically unstable and appropriable. The architecture provides a minimal frame, flexible enough to house unpredictable future functions such as dynamic urban art, crafts and services. The form of the business district changes at an average pace of twenty years. Autonome departementen binnen de Department City. The arts department, architecture before appropriation. 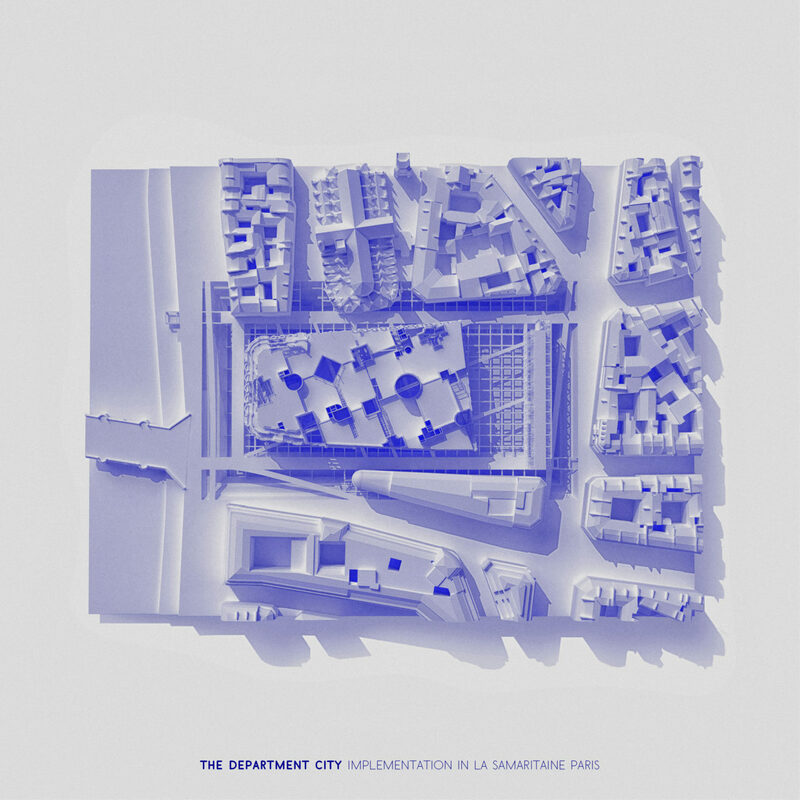 The Department City is more of a short-term scenario than a finite project, its blue colour suggesting conditions instead of prescribing solutions. It is a blueprint which when appropriated becomes architecture, an architecture about life and colour. Longitudinal section. The business district above the housing district. I’m currently doing my first professional steps in the world of architecture.Since November 2016 I work with the Office for Metropolitan Architecture, trying to get a practical understanding of how radical concepts can be turned into actual buildings. What hope / do you want to achieve as a designer in the near and / or in the distant future? I see the architectural drawing as a palimpsest that can constantly evolve into new territories. In the future, I would like to find my place in the profession, through the use of various media and drawing inspiration from references placed outside of the traditional field of architecture, like archaeological drawings and theatre scenic design. In collaboration with Archiprix Archined publishes the graduation projects of Dutch design schools/departments that are selected for the Archiprix 2018.